It's not often that I come across a product that I fall head over heels in love with, but this is one that I have found myself talking about nonstop since it's arrival, even to my non-parent friends! A month or so ago I was on the hunt for a play mat for Evie. We had a regular one - you know the type - one that starts as a baby gym with arches and dangly toys and once your small person can sit up you remove the arches and are left with a small scrap of a mat with tickly bits and scrunchy bits and squeaky bits. We got to that point with E and realised that the mat we already had wasn't what we wanted at all. The downstairs of our house is all solid wood and stone floors and it just wasn't thick or big enough for my roly polying little madam, but I couldn't find anything suitable for love nor money so I made do and improvised with a king size duvet underneath for extra padding. This did the trick, but looked an absolute shambles - and the extra padding may have protected madam from the hard floors but the whole thing still wasn't big enough now that she was on the move. Then, as if by magic, an email popped up in my inbox from a company called Cosyplay - makers of luxury memory foam play mats for babies - asking me whether I would be interested in reviewing one of their products. As soon as I looked at their website I realised that this mat was exactly what I had been looking for. Cosyplay baby play mats are made up of a patented four layer system (including one inch of memory foam) which makes them ideal for use on hard floors and outside. The top cover is a super cuddly, fleecy fabric (which is machine washable and fine in the tumble drier!) and the main body contains waterproof layers and as well as a waterproof base, which means you can even use it on wet grass! Although Evie is coming up to eight months old now, this mat is suitable from birth and is perfect for early tummy time (which is SO important - read here to find out why) and for parent & baby bonding time. It's huge as far as play mats go - 1m x 1.5m - so there is plenty of room for Mummy or Daddy to sit on it too (and I can confirm it is VERY comfortable - I may* have fallen asleep on ours last week). But enough of the specifications - take a look at this here video for more information on why this mat really is fabulous. If you are looking for a play mat I would wholeheartedly recommend you check this company out. If, like us, you have hard floors at home then this is an essential! No other play mat out there compares to this one. 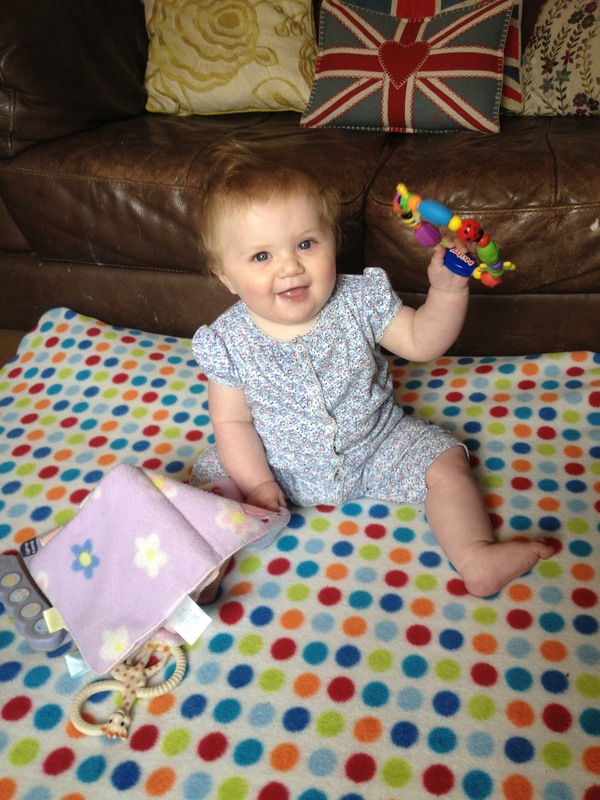 Cosyplay Baby Play Mats are available to buy from the Cosyplay shop here for £85.00. You can also buy extra covers (which are very handy for when one is being washed or if you can't make up your mind which colour or pattern to go for!) for £17.50. 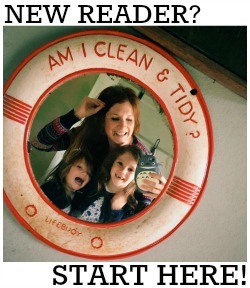 However I have one to give away to one lucky Modern Mummy reader! As per my usual giveaway terms and conditions, I'm using the Rafflecopter widget below. Everyone is entitled to a six entries each - you can follow me and Cosyplay on Twitter, like us both on Facebook and tweet about the competition too. 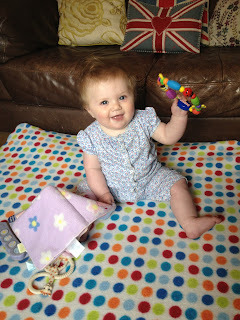 For a bonus entry, you should leave a comment below, telling me what you think is the best feature of the Cosyplay Mat. The competition closes at midnight on 10th July 2013 and the winner will be announced on here, on Facebook and on Twitter on 11th July. This competition is open to UK residents only. I love how thick it looks! We've got all wooden floors so we've got the same problem that you had! Ha my living room is currently covered in a quilt!! I love the fact its washable you know how messy babies get! As we have laminate flooring I love the idea of the extra padding - think I'd want to lie on it myselg! I like that you can roll it up to store it. I love that it is machine washable and a great size. The size, and that it's easy to store. The removable zip cover, good for ease of washing. I love how thick it is. Currently trying everything on oir wooden floor as my 4 month old just started rolling and constantly on the go. I even use it on our concrete patio. It really is made for hard floors. it looks so comfy ! easy to store, so good. I love the fact its easily washable, we all know how much mess a baby can make. I love the fact that it can be easily thrown in the washing machine, plus it is easy to store away or transport to grannies house. Isn't it funny how many of us go for the washing factor - I'm going to say tumble drier, washing it one thing but being able to get it back in action quickly is brilliant. I love the fact that it contains memory foam - perfect for my hard flooring! The large size is a great feature. I love that it can be washed, which is essential and the colours are lovely and bright too! definitely that it's machine washable! That it's washable, and bright and colourful. Lovely and bright and the fact it is machine washable is a real boon! that it is machine washable! How handy! our entire house has stone tiled floors, even upstairs! (we're renting and agree its stupid!) so this would be perfect for what we need with a shuffling 7 month old who went into the crawling position for the first time today! The machine washable cover, very handy! I love the colours, bright and playful which is how it should be. I love that the removable cover is machine washable! I love the design and the cuddlesoft material.